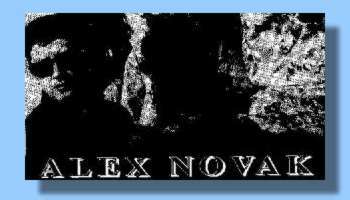 Novak helped form The Tempest and music journals picked up On the band straight away. Musically, they were more structured and Novak, was described by Sounds as " ..A man whose square jaw and hardened features betray his Slavonic roots". Another clue to this man in black. On still further, and Novak became frontman again for established synth experimentalist combo, Attrition. Unhappy in another mans project, and with no media appraisal of his facial attributes Novak forms anew, and triumphs. Based on French label, Danceteria, the Northampton bred Venus Fly Trap are set to grow in stature with their new single Achilles Heel, taken from the new album Pandoras Box and Alex Novak is in the limelight more than ever before. The following interview is by Justin Mitchell, Could you explain the start of Religious Oerdose, at the time of the second wave of punk? Well the initial punk thing was about getting up and doing things for yourself. Before that, bands were very far off, doing things that other people did, rather than yourself, and punk got rid of that barrier and it allowed people to express themselves, like setting up their own labels and getting their own bands together. I thought that one of the strongest ideas about punk was the fact that if you really wanted to do something, it was possible. Obviously, that got me involved in music. Then the whole punk movement became like a uniform, like you were supposed to be wearing a certain kind of thing. The fashion side became more important than expressing yourself. I became fed up with that scene and switched to bands that were doing something a bit more interesting, like Cabaret Voltaire, Clock DVA and the early Human League, bands that were trying something different. So, Religious Overdose came from that side and released three singles in all on Glass Records. Glass Records was the home of bands like the Jazz Butcher, In Embrace and more recently, Spacemen Three. I think that time, locally, there was more of a good scene, with Religious Overdose, Where's Lisse?, In Embrace and Attrition all doing something interesting, though. musically all probably very different. There was a cammon feeling that joined it all together, just something from a particular period that you couldn't put back together again. After Religious Overdose split, you went to form The Tempest? Was that like starting from scratch, a new style and a new audience, or did you retain some of the intrests that had been created from Religious Overdose? AN - Well, with Religious Overdose, we started off with a drum machine, being fairly minimal, they weren't songs as such. They were just riffs that were repeated and it relied on just playing off each other really. As it progressed, it became more and more song structured, but still a reaction against things, doing something different. The Tempest were alot more rocky, I suppose. Were The Tempest records released on Glass? AN - The first single came out on Glass, then we moved to Anagram Records, part of Cherry Red. We got signed up for, I don't now how many records but I don't think we ever completed it, because by the time the album, 5 Against The House came out, it was about over really. Within the band, there was another group doing things. so it was really complicated. The Tempest split in 1984, after two years, one album and two singles. The next group you were involved with was Attrition, which you joined in 1985. You've already mentioned that they were on the scene back in the early days. AN - Yeah, they were people whom I'd always been in contact with. My interest in music has always been fairly wide. I like alot of different sorts of stuff, and although Attrition were coming from a slightly different angle than The Tempest, I've always felt there's been a thread of things going through whattever I've done. Attrition were interesting as it was a different way of working, a lot of it was studio based, and live we used backing tapes, and tended to rely a lot more on the visuals, using slides and making up for the fact there's not that many musicians ~ there. I think the problem with alot of people is they think there is only one way a band should be set up, but it's not true. You can work in as many ways as you want, as long as what you produce is good at the end of the day. I think people have a problem with electronic bands live, because they need to see people moving about, and that's why you tend to see a lot of electronic bands using videos and special lights, as that side gives the audience a clue as to what is going on with the music, so it helps. By the time I joined the band. it was moving up from the initial DIY thing into something a lot bigger. Their old label, Third Mind Records, started off producing just cassettes, and now their record/CD packaging is very important, and the way it is produced. The visuals, album sleeves, photographs, it's all just as important. It all needs thought. Were you based in Northampton while you worked with Attrition? AN - Well, Attrition lasted for one and a half years and I lived that time in London, I left as it was really someone else's project, but came back to Northampton as I knew there were people I knew I could work with, people who are very good at what they do, who just need some sort of outlet. Over the years, I've built up a lot of contacts, and that's one of the most important things for bands to take on. It's a big problem with most bands that they don't actually find out for themselves what's going on by writing to others. I always believe you create your own possibilities. Like, I've always contributed to cassette compilations across Europe and you can always argue that it's not worth doing because it reaches only twenty people, but I'll always argue that the possibility is there that someone might pick up on it, and then something completely different happens. It's like people who send, say, ten demo tapes and expect to be signed up. How did Venus Fly Trap form, and how quick1y were you picked up by a label? AN - Well, when 1 came back to Northampton and formed Venus Fly Trap, the first thing we did was record a demo which appeared on Dave Henderson's (ex Sounds writer) Music From the Dead Zone compilation. This was before we'd even played live! That came out after just six months of us being together and within a year we were signed to Tuesday Records. Tuesday were connected, distribution wise to Danceteria. Eventually, we moved to them. What are the advantages and disadvantages of being on a Frenchlabel, as opposed to a UK based one? AN - The disadvantage is the phone bill! No, I really don't think there is a disadvantage. The biggest problem is distribution and as long as the releases are distributed properly, it doesn't matter where the record company is based. Also. everything from them is a one-off, so, we have a contract for each record rather than a recording contract. That siutes us, as if anyone offers us something to do. we're not contractually obliged and, equally. you should be with a record company because you think they are good, and want to work, not just because you're tied to them, There's a lot of good stuff on Danceteria that I like. Less the poppy stuff, but people like The Grief, Jive Turkey, Jivaros Quartet and The Outlines. We're sitting amongst groups that are within a similar vein. How do you feel about the album, compared with previous Venus Fly Trap releases? AN - Well, I never put the past down, to say it's better. You need to have done it, to have reached where you are now, it's just a progression. Obviously, 1 think it's a step up, because it's a lot more focussed. There are equally as good ideas on Totem, but with the new album they're better done, a bit more articulate. It comes through experience, getting used to working in studios with people who are better at playing their instruments. Why the title Pandoras Box? AN - I never sit down and have a great plan. I like the William Burroughs way of working. When I normally write lyrics, I hear a line, whether it's on TV or in a newspaper, take it out of context, and just write it down. Eventually, you end up with a page of things that are not rally connected, but they are in some way, or alot later you may find a connection. Burroughs thought that when he would cut up a newspaper and rearranged the pieces, move things round a bit, he'd find the real message. I really like that idea, so I use that as a starting point, finding things that are not really connected and try to tie them together. I thought of Pandoras Box around the time of recording. It fitted with the general theme of the album, which is Pandoras Box, as in the Greek myth, with regard to eastern Europe, something that has been locked away for so many years. When someone releases it - not only do you get the good things coming out, like hope and democracy, but you have the things that were locked away for fifty years, like neo-nazis, nationalists, as we've seen these past few months. Are there to by any live dates to promote the new single and album? Strangely enough, we're playing in Czechoslovakia, I wonder if anyone will click once we get there, we'll see, and also playing France. Belgium. Germany and England a lot more this year. So, are you happy with the album - Pinnacle of the Novak career?